The kitchen, by its very nature, is probably the most heavily trafficked and most popular room in your home. Organized, clutter-free drawers make meal prep a breeze. It's where the family gets together for meals, where friends gather during dinner parties, and where you get each day off to a fresh start. A well-organized kitchen allows you to enjoy more fully every minute in it. Since the kitchen is where memories as well as meals are made, you'll need to consider both functionality and aesthetics as you declutter and organize each element inside. These kitchen clutter solutions can help streamline this busy hub and make it fully functional for all you do inside. Kitchen clutter solutions start with a place for it all: so let's start with a biggie - all those essential cooking tools. 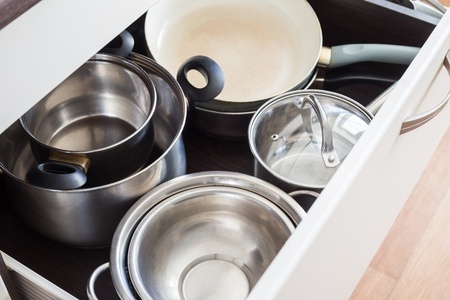 Organize drawers by grouping your most frequently cooking tools in ceramic jars or other attractive holders on countertops. The drawers will be neater - with more space for other things - and you'll be able to get to must-have utensils quicker. Clear canisters with airtight tops can hold and display such frequently used foodstuffs as bread, bagels, and pasta on countertops. When you see a particular food item, you're more likely to eat it before it spoils. And you won't buy more of what you don't need. Keep kitchen countertops uncluttered while using them for display. Place an attractive, shallow wicker basket, small wooden crate or other container on a counter to hold treats for the kids or fill it with the snacks you like to grab on the run. Use antique, decorative tins or old-fashioned colored-glass mason jars to store your collections of tea bags and matchbooks - or as "hiding" places for dog biscuits and kitty treats. Fruits and vegetables can take center stage in an attractive, breathable basket or metal mesh container on the kitchen table or in the windowsill, instead of taking up space in - and being left to spoil unseen in - the back of the refrigerator. Organize kitchen cabinets and drawers by storing like items together. 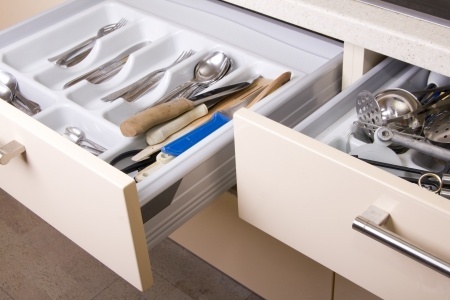 Declutter kitchen drawers easily by adding adjustable & expandable drawer dividers. If your cabinet shelves are not adjustable, subdivide the space with expandable wire cabinet racks. It makes getting to pots, pans, dishes, and pie plates easier than when they're piled up all the way to the shelf above. This wire rack system works equally well with items in the cupboards or pantry. Make the most of overhead cabinets by hanging stemmed glasses beneath them. Store your holiday cookware and the cake tins or roasting pans you use infrequently in those hard-to-reach cabinets high above the fridge. Finally, to make everyday cleanups quicker, assign one large cabinet and one drawer near the dishwasher to serve as home for the daily dishes and silverware. If you have extra sets of dishes and far more place settings than you have household members, stock this area with just enough dishes and utensils to get everyone through the day and to make unloading the dishwasher less of a chore. Double the number of place settings if you run the dishwasher only every other day. Store the rest of the service in a place that's less convenient but still accessible, so it's handy when your meals require more dishes and glasses than you'd planned for.